ICE CREAM! an original song by MusiCampers! Our Composition and Song week is always so creative!!! And so productive!!! What you’re hearing right now is an original song written by the MusiCamp campers from the Composition & Song week of 2013. We run a slew of creative song writing exercises throughout the week, some where the campers work independently on theirs songs, others where they work in groups. These exercises challenge the kids to think of how a pop song is made and the different components that make an effective song – the hook, the chorus, the intro, the verses, the ending, etc.The young campers also learn to identify chord structures in a very practical and accessible way. They even make instruments, like the diddley bow or the bucket bass, and are able to play the basic I IV V chord structure on the instrument! By the way, ICE CREAM! was written as a collaborative exercise where all the campers contributed to the making of this song. And every year, in just one week’s time, these inspired youngsters write wonderful music! It is always such a blessing to work with these young creative minds! This year Composition & Song week runs from July 15-19, 9am – 4pm. We still have spots! You can register here. MusiCamp had another wonderful summer of creative musical growth and fun! It always goes by so quickly that sometimes I don’t get to properly express my gratitude for having the chance to work with such talented and sweet kids – here at our studio and at the festivals and on-site workshops we offered, like those at Union Station. And before Fall comes rolling in and the school year takes over our parental lives, I want to thank you all – campers, parents, volunteers, guest artists and wonderful inspiring music makers – and wish you a wonderful year ahead. Keep and eye out for more MusiCamp events – our adult singing workshops will start in October – and we look forward to a new line up of all-day summer camps for 2017! Pizza Making – it’s an art too! As I mentioned in previous posts, MusiCamp was considering the possibility of campers making washtub basses as well as diddley bos this summer. So, this past Victoria Day my partner and I attempted to make a washtub bass. For those of you who don’t know, a washtub bass is a one-stringed bass made up of a stick, a string, and an overturned washtub as the resonator (or better understood as what amplifies the sound of the plucked string). Tin olive oil container on left and 5 gallon plastic bucket on right. We tried two different containers (the resonator of the instrument), two different strings, and a variety of playing techniques. While we quickly resolved what physical equipment (resonator and string) worked best, the playing techniques is clearly a work in progress ;) . One container was a food-industry size oil container. It was metal and so I figured it would resonate more like a traditional washtub than the other alternative resonator, the 5 gallon plastic bucket. But the plastic bucket had a way fuller sound and the one we much preferred. The two strings we tried was a cotton rope and a plastic weed-wacker line. We liked the rope more but it busted before we even got a chance to properly savour the sound. Luckily, the sound of the weed-waker line wasn’t dramatically different from the rope. The construction simply involved taking a rake or broom handle, indenting a groove on one end and drilling a hole in the other. We also drilled a whole in the middle of the container/resonator. 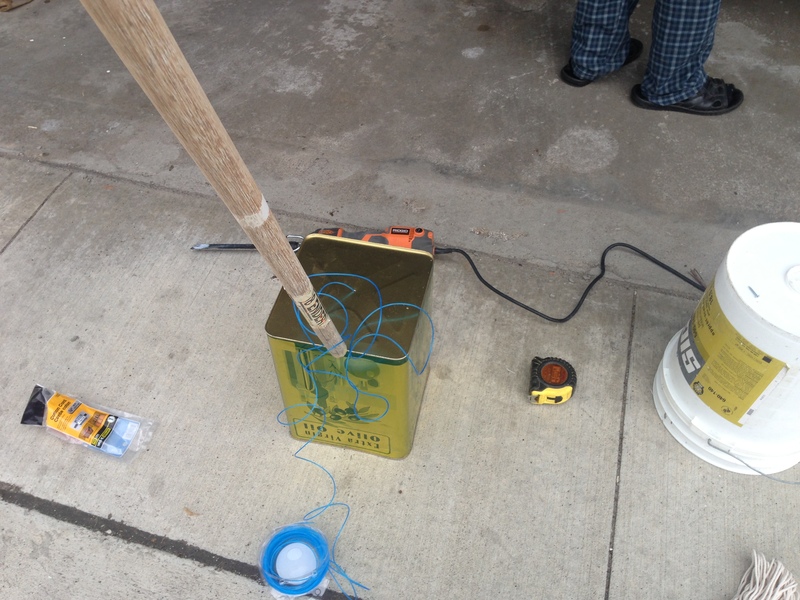 We then tied the one end of the weed-waker line to the container/resonator and the other end to the stick (which involved wrapping it around the stick a number of times and then securing it with duck-taped). Then we inserted the groove/indent on the rim of the bucket, the string becomes taught, and we started to twang away. I had assumed that playing different pitches/notes involved moving the stick back and forth; however, this seemed very difficult to keep in tune -as you can see in the youtube video below. The playing technique that I soon adopted involved placing the stick a little closer to the centre of the bucket and using my fingers (usually just the index finger or the whole hand) to pitch the notes as well as moving the stick. So, while I still need to work on the bass playing technique and possibly experiment with the instrument design to help secure the stick a little more (and thereby the intonation of the pitches/notes I play!) it is quite a simple thing to make and it makes a great bass sound! Final say on the wash tub bass at MusiCamp? It’s definitely going to happen. I.e., if campers want to make one, it is very possible!